Wifi & LAN Network to connect to Internet for Youtude KARAOKE and surfing net. Built in latest version: KODI, Vietmedia, Viet TV 24, watch live Sports, Movies, & TV Channel. Airplay Control and Select Song from HDD & Youtube Karaoke by Iphone, Ipad, Android, Tablet. Newest Model: 2019 SINGTRONIC KA-550M If you are looking for the professional karaoke mixing amplifier for your home, bar or club with USB Recording Functon, look no further than SINGTRONIC KA-550M Professional AV 500W + 500W Digital Mixing Amplifier Karaoke. Designed by Japan Engineer, SINGTRONIC is known for its quality and durability. This professional mixing amplifier was built to sustain continuous usage at maximum wattage output. It is a perfect companion for DJs and KJs who are seeking for a reliable component that will carry them throughout the long night without the nightmare of equipment failure. Newest Model: 2019 SINGTRONIC KS-500K, the best known name in professional karaoke around the world with unprecedented sound quality and 500 Watts power. The exceptional quality and smoothness of sound over the entire audible range ensure unprecedented excitement. Once you have sung with these speakers, you will never be satisfied with anything less. The clubs and bars that use these speakers will enjoy an excellent reputation among their customers. We have every confidence in the outstanding sound quality of these speakers. Newest Model: 2019 SINGTRONIC UHF-550 Professional USB Rechargeable Lithium Batteries Wireless Microphone System is the right solution for Karaoke vocalists, Experience the ultimate freedom and versatility with the SINGTRONIC UHF-550 Professional Dual Channel Module Wireless Microphone System. The Dual channel UHF wireless microphone system with each microphone on its own independent UHF channel will gives you maximum utilization without the fear of frequency interference. Going wireless means that you are free from cables for up to 500 feet of range from the receiver unit. Plus, a super energy battery saver Handheld Microphone will last singing throughout the entire night. 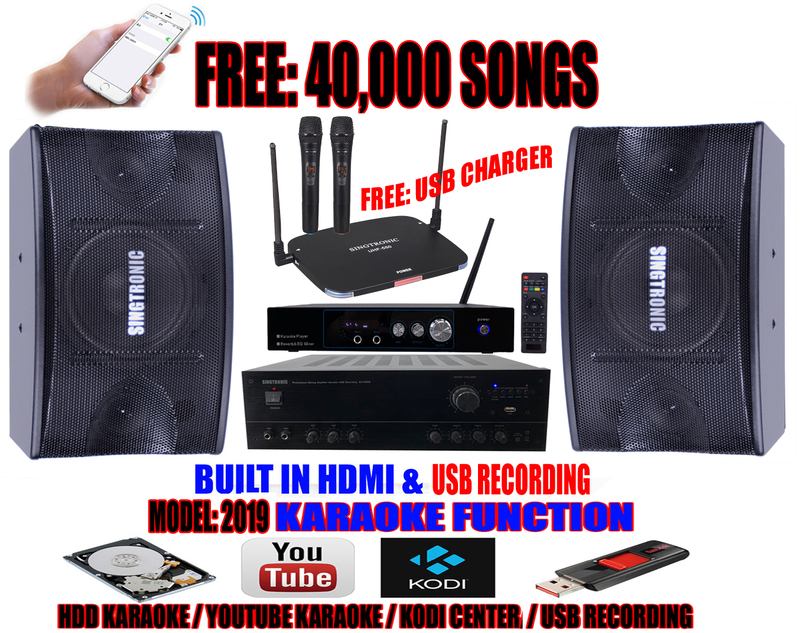 Newest Model: 2019 SINGTRONIC KTV Karaoke-On-Demand (KOD) is the latest and most advanced HDMI (4K) UltraHD & Full HD 1080P Hard Drive karaoke player in the world comes with 2TB to 16TB hard drive which can hold approximately over 100,000 songs karaoke vocalist tracks. There are many new features that differentiate KTV from the rest of the players in the market. It�s capability of recording any DVD/VCD/CDG& MP3G discs onto the hard drive through USB Ports makes it so much easier for users to add their favorite music into the collection. KTV comes with a USB device that allows you to ripping all CDG disc. into MP3G song files and able to playback any supported MP3, MPEG, AVI, MKV, DivX, VOB & JPEG files anytime. The unit also has a HDMI output which provides (4K) UltraHD and Full HD 1080P High Definition Multimedia Interface videos for its consumers. Its so easy to use both on-screen navigation with "Song Search" & Singing Display Lyrics screen display on your TV , excellent audio and full 1080P video quality. USB Wifi Function Newest 2019: It seems very interesting to choose a song via a Cell Phone or Tabet PC. YES, you can choose a song without a songbook, you don't need to strenuously searching your favorite songs one by one by gluing your eyes to flip pages by pages, or you don't need to operate the menu to avoid interrupting others. Indeed, you can select your favorite songs by Cell Phone or Tablet PC by connect to the KARAOKE machine via wireless USB Wifi network, then you can choose your favorite songs on your Cell Phone. The process is easy to operate and avoids wasting time to locate your favorite songs. SINGTRONIC.COM WILL BEAT OR MATCH ANY LEGITIMATE PRICE !